This clipping was handed down in the family. There was no date nor name of newspaper and the continuation of the story was not saved. The article appeared sometime in 1942 about the time the park closed. 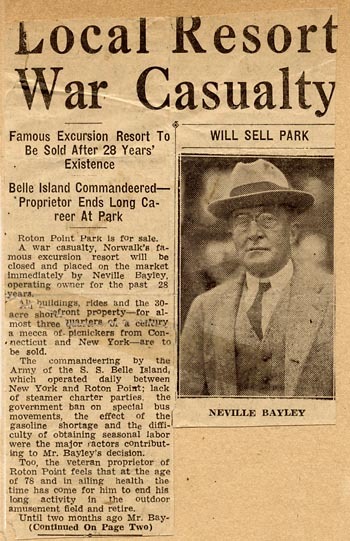 Neville Bayley, who had been managing the park for several years, bought the park in 1928 and made improvements and added attractions. He was about 78 years old at the time of this article. The decision was made to close at the onset of World War II because of the rationing of gasoline, shortage of seasonal laborers, the comandeering by the army of the SS Belle Island, and the government ban on special bus movements. The park never reopened.